I received a copy of this via NetGalley and HarperImpulse in return for a fair and honest review - thankyou! Wow!! What a book! It was an absolute delight to read and once I'd started reading I couldn't put it down! I even ignored the phone ringing so I wouldn't be distracted but shhh don't tell anyone! That's our little secret! Any book set in a bookshop has my interest immediately and this perfectly captured what every booklover knows! The spell that most bookshops, yes even the rubbish ones!, can cast over you as you enter knowing that you are bound to be swept away in another adventure. And in this book we meet Posy whose whole life has revolved around 'BookEnds' the bookstore in Bloomsbury as her father used to be the manager, and her mother used to run the teashop that adjoined the shop. 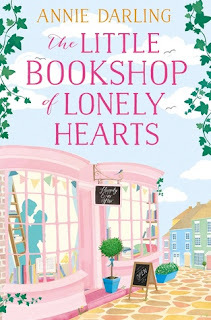 Every memory she has is within the walls, and when the owner, Lavinia, who was like a surrogate grandmother to Posy after the tragic death of her parents, passes away, she feels like her whole world may crash down around her and her brother Sam as they live rent free in the flat above the shop. But Lavinia knows how much the shop is part of Posys' life and leaves her the shop in her will under the proviso that she turns its' fortunes around in 2 years as the bookshop has been struggling for quite a while. It's a daunting challenge but Posy has lots of ideas but she's not sure whether she's brave enough to go for it. Lavinia's only grandson is Sebastian and he and Posy grew up together around the shop so have a history! His interest is purely financial, despite being an extremely wealthy individual already, and is keen to see the shop closed so he can see the benefit financially. He and Posy have a pretty fiery relationship based mainly on him teasing her and this banter does add a fun side to the story. You will find yourself willing Posy to succeed in her endeavours to revitalise the shop and get her 'Happy Ever After' as you feel nothing but empathy for her as she's been written in such a sympathetic style. And despite the hard times she's gone through the shop has always been there for her so she will do anything she can to see it through. We also get glimpses through the book of Posy and her attempts to write her own novel in the style of a regency romance and this was such a cute thing to do, especially as you see how that story unfolds in relation to real life happenings! Posy is such a romance novel fan that it is wonderful to see so many mentions of classics appear throughout the book. So i gave this book 5 stars on GoodReads and was extremely delighted to see that this is just the first in the series so will be eagerly awaiting the next installment..... Spring 2017 seems a long way away already!! Book Reviews - two for one!